This painting has been recently completed and can be compared to the photo in the recent blog entry below. 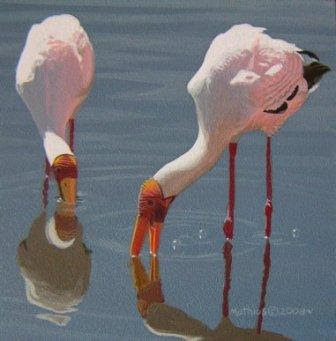 This is a commissioned painting based upon an earlier original called Greenwing Reflections. 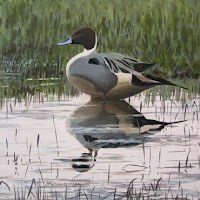 In this piece, the teal is placed differently and has a slightly different posture - looking more into the scene than sideways. 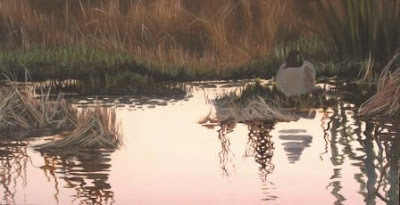 The low light was my initial attraction to create this painting as were the reflections of unseen habitat. I haven't been on this blog too much because I had some sort of stomach flu... not fun. I did manage to work in a daily painting and a newspaper interview, but have been pretty laid out. Fortunately, things began to look up last night as my condition improved and I can get back to painting again! 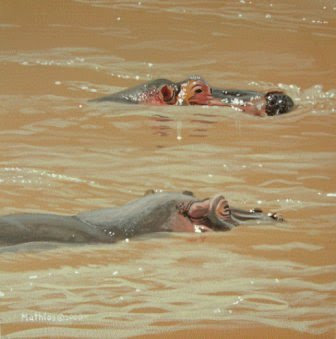 I received some fantastic news today that the painting Evening Sprig has won the competition. Thank you to everyone who voted!! Below are some paintings that I have been working on. The first one is a commission that is based off of an earlier painting called Greenwing Reflections and is in a very early stage. This next one is still in the works and has been so for nearly two years!! I have messed around with it by adding a coy just under the surface, but it didn't seem to work with the leaves in the water. A water skeeter has been suggested and I am going to see what that looks like. I am thinking that the design may be strong enough as is with all of the action from the water drops. 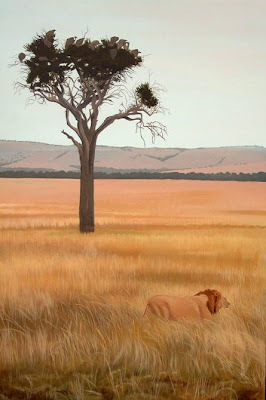 I am excited about this painting, which was recently posted, because of the vultures in the tree and the story the painting tells. For a little over a month I have been completing postcard size (and smaller) paintings almost everyday. Over this time frame they have morphed somewhat from being studies to being a bit more complete. I have also started a blog - link here - that is updated each time one of these paintings is completed. One new feature on this blog is a box where, if interested, you can receive an email containing an image of a new painting each time one is posted. Below are some examples of my recent daily paintings. 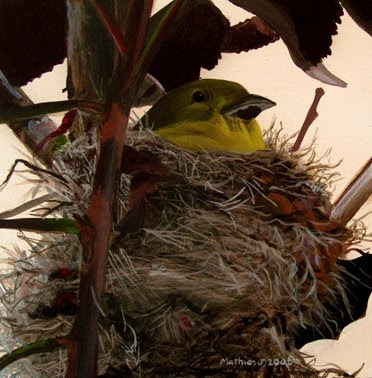 Tomorrow evening is the reception for American Miniatures at Settler's West Galleries in Tucson, AZ. This is a fantastic show with many of the top artists in the country participating including Howard Terpening, Bill Anton, and Tucker Smith. To see the incredible list of artists and to view their inspiring work you can click here: Settlers West. 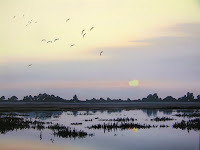 My painting Great Egret(pictured) along with Pintail Pair will be a part of the exhibition. 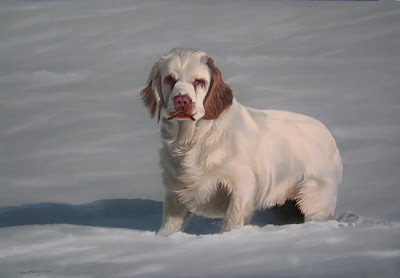 This commissioned painting of a clumber spaniel took awhile! Measuring 24"x36", it provided many challenges and pushed me as an artist - mostly because of the white dog on white snow combination. By pushing the colors a bit, the dog is able to stand out.